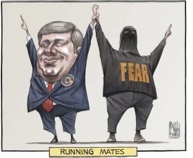 Many Canadians are aware of the Harper government’s big fear agenda in this federal election. Bill C-51’s threats to the fundamental rights and liberties of Canadian citizens have been highlighted by judges, present and former MPs, lawyers, academics, unions, environmental groups, First Nations, civil libertarians, business leaders, and mainstream media. I would like to begin by thanking the CLA Intellectual Freedom Advisory Committee, and Alvin Schrader, Chair and former recipient, for choosing me for the prestigious CLA Advancement of Intellectual Freedom in Canada Award. It is an honour to follow in the footsteps of June Callwood, Les Fowlie, the Toronto Public Library Board, and other exemplars of intellectual freedom in Canada. This award does not represent the work of one person but the work of many. Thank you to all those involved in the work of the BCLA Intellectual Freedom Committee, and the BCLA and CLA Information Policy Committees. I would especially like to thank everyone who wrote such generous letters of recommendation about my work. The early years of the BCLA Intellectual Freedom Committee focussed, like many, on defending individual authors and books from censorship. We participated in Freedom to Read Week and developed educational materials, but our work was primarily defensive. However, a climate was developing, following the example of the Reagan Administration, to reduce government collection of data and access to it. The suppression of information access through self-censorship and government regulation was growing. SFSC Article: BILL C-51: SHUT IT DOWN BEFORE IT SHUTS US UP! Posted on March 13, 2015 by Seriously Free Speech Committee| Comments Off on SFSC Article: BILL C-51: SHUT IT DOWN BEFORE IT SHUTS US UP! A spectre is haunting Canada, the spectre of so-called “anti-terrorism legislation”, raising fear in order to enable control. The Harper Conservative government, supported by the Liberals, is about to pass Bill C-51, the 2015 Anti-Terrorism Act, that substantially expands the already-considerable powers of CSIS (Canadian Security Intelligence Service), the RCMP, border services and other agencies. Among other things, it lowers the bar for “preventive detention” if an agency thinks someone “may” (changed from “will”) commit a crime. It lowers standards for putting someone on a no-fly list, and broadens the definition of “terrorism”. Under Bill C-51, you would break the law “by speaking, writing, recording, gesturing or other visible representation, knowingly advocate or promote the commission of terrorism offenses in general”. Comments Off on SFSC Article: BILL C-51: SHUT IT DOWN BEFORE IT SHUTS US UP! The Harper government’s Bill C-51, or Anti-Terrorism Act, has been in the public domain for over a month. Long enough for us to know that it subverts basic principles of constitutional law, assaults rights of free speech and free assembly, and is viciously anti-democratic. An unprecedented torrent of criticism has been directed against this bill as the government rushes it through Parliament. This has included stern or at least sceptical editorials in all the major newspapers; an open letter, signed by four former Prime Ministers and five former Supreme Court judges, denouncing the bill for exposing Canadians to major violations of their rights; and another letter, signed by a hundred Canadian law professors, explaining the dangers it poses to justice and legality. But the Anti-Terrorism Act is more mortally dangerous to Canadian democracy than even these indications would suggest. A central section of the act empowers CSIS agents to obtain judicial warrants―on mere suspicion, with no requirement for supporting evidence―that will allow them to supplement other disruptive actions against purported enemies of Harperland with acts that directly violate the Charter of Rights and Freedoms and other Canadian laws. Ever had the rug jerked out from under you? Had your life forced into a sudden 180 degree turn? Steven Salaita has. The young professor, author or editor of six books and numerous articles on indigenous peoples, colonialism, and Arabic culture, was a well-liked tenured teacher at Virginia Tech University. Over a year ago, in autumn 2013, he accepted another tenured position in American Indian studies at the University of Illinois at Urbana-Champaign. He and his wife quit their jobs in Virginia, sold their house, moved north with their child, and Salaita began preparing classes. Then in August, three weeks before classes were to start, came the surprise. Pro-Israel students and wealthy donors to the University of Illinois, some of them prominent Zionists, had monitored Salaita’s personal Twitter account, on which he had registered angry comments during Israel’s brutal attack on Gaza. Doubtless they also knew that he had been active in the BDS—boycott, divest, sanction—movement to pressure Israel into ending its occupation of Palestine, and particularly the academic boycott of Israeli academic institutions. They may have known that his parents are Jordanian and Palestinian. The Seriously Free Speech Committee opposes Kinder Morgan’s SLAPP suit against Burnaby Residents Opposing Pipeline Expansion and four protesters and joins with more than 65 community, environmental and labour groups and thousands of citizens condemning this outrageous attack against citizens’ rights of free speech and protest, including civil disobedience. 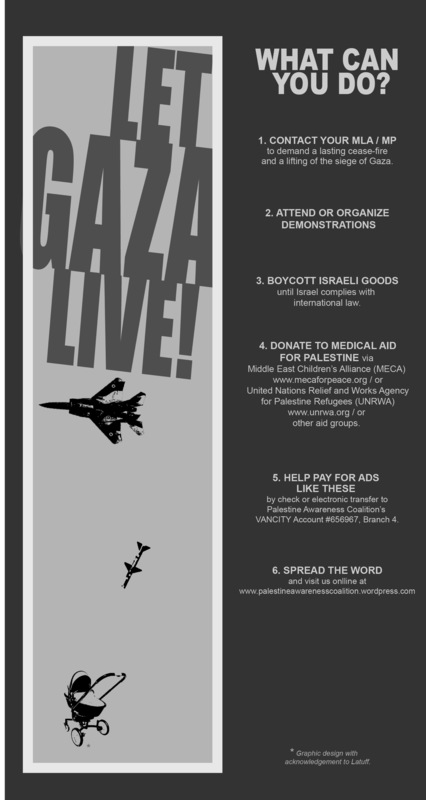 WHAT CAN YOU DO TO SUPPORT GAZA? 1. Contact your MP to demand an end to the siege of Gaza: Find your MP using your postal code! 2. Attend or organize demonstrations. These demonstrations are coming up in Vancouver, Friday August 8 and Saturday August 9. Please join in! 3. Boycott Israeli Goods. Some products you should boycott include SodaStream, Keter Plastics, Hewlett-Packard electronics, Sabra hummus, and Ahava cosmetics. Learn more about the global boycott. 4, Donate to medical aid. Two excellent organizations providing support are the Middle East Children’s Alliance and the UN Relief Works Association (UNRWA). 6. Spread the word and raise awareness about Palestine! Share this page on Facebook, Twitter and other social media. The Palestine Awareness Coalition is comprised of a number of Vancouver-area organizations, including SFSC, collectively working to raise awareness. Joint Submission by SFSC and IJV-Canada to the Parliamentary Committee on Justice and Human Rights about Bill C-13, the supposed Anti-Cyberbullying Legisation. This kind of “lawfare,” as it is sometimes called, is nothing new (nor, one can add, is the notion, also discussed at this meeting, of bolstering surveillance of pro-BDS organizations by military intelligence, the Shin Bet Security Service, and the Mossad). It’s also evident that the pro-Israel lobby has been active in mobilizing politicians in the “friendly capitals” of Washington, Ottawa, and Canberra for many years. Recent fruits of that labour have included, in Canberra, threats made in June 2013 by Julie Bishop, a senior member of Julia Gillard’s incoming Australian government, that “supporters of an academic boycott of Israel” would have their “access to public research funds summarily cut off.”6 In Washington, a bipartisan “Protect Academic Freedom Act” that would deny federal funding “to colleges and universities that participate in a boycott of Israeli academic institutions or scholars”7 has been brought before Congress. 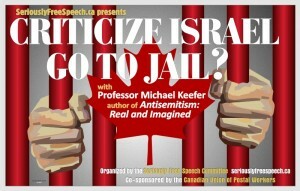 This essay will argue that revisions to the Canadian Criminal Code proposed by the Harper government contain wording that is designed to enable lawfare prosecutions of human rights activists in precisely the manner desired by Mr. Netanyahu and his associates. VANCOUVER, October 10, 2013 – The “Disappearing Palestine” wall mural displayed at a Canada Line SkyTrain station was stolen by vandals for the third time overnight on October 9, shortly after it was replaced following two earlier thefts. The ad, part of a campaign by the Palestine Awareness Coalition, has been running since August 27. The Skytrain ad was vandalized previously on the weekends of September 21 and October 5, when it was also stolen from the station by unknown vandals who appear to have scraped the ad from the walls. The ad has been re-posted again. The Coalition is not aware of any suspects being identified in the repeated thefts.